It has been a busy couple of days for the Florida Gators, particularly on the recruiting front where the team has added three important prospects. 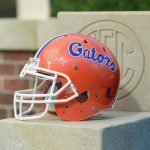 Somewhat-unfortunately for Florida, not all of the players are part of the incoming Class of 2019 and therefore may not be able to help the Gators for a few years — should everyone remain committed. The biggest fish of the bunch was reeled in Sunday when five-star 2021 defensive end Bryce Langston (Ocala, FL) committed to Florida over Florida State. The local product is ranked as the No. 4 overall player in his class by 247Sports, which does not have a composite rating for him at this time. “Blessed To Announce That I Am Committed To The University Of Florida,” Langston wrote on Twitter. Langston (6-foot-3, 212 pounds) is actually the second 2021 pledge that Florida has added in the last few days as four-star wide receiver Trevonte Rucker (Ocala, FL) committed on Nov. 26. The Gators’ four-man Class of 2021 is now ranked No. 2 in the nation. Even more important for UF at this time is the 2019 commitments it saw announce on Sunday. Three-star offensive lineman Kingsley Eguakun (Jacksonville, FL) flipped from Miami to Florida just five days after being offered by the Gators. Eguakun (6-foot-3, 300 pounds) may not be highly ranked but he is a key commitment for a team looking to build depth along its offensive line next season. Florida also saw four-star 2020 athlete Jaquavion Fraziars (Dunnellon, FL) pledge on Saturday. Fraziars (6-foot-4, 185 pounds) has the potential to be a big-bodied receiver and potential first-year contributor should he stay committed to the Gators. “I Am Very Blessed To Say [I] Am Committing To The University Of Florida,” he wrote on Twitter. Due to other programs adding players, Florida has actually fallen to the No. 21 overall class in the 247Sports Composite team rankings for 2019; the Gators are ranked 11th overall in the SEC. 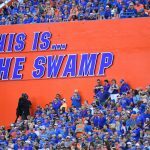 UF’s 2020 class is presently ranked No. 5 overall. Florida still has a number of weeks until the first National Signing Day of 2019, but suffice to say, head coach Dan Mullen and Co. have plenty of work to do. There were also reports Sunday that three-star DE Jonathan Greenard intends to transfer as a graduate student from Louisville to Florida in order to play immediately. Greenard is a team captain for the Cardinals who missed most of the 2018 season with a wrist injury. However, Louisville clarified earlier in the day that Greenard had not spoken to UF about a transfer opportunity and had not made any decision at this time. I can’t imagine a recruit who was watching the SEC championship game wanting to play for Kirby. “Smart” he’s not. It wasn’t just the ridiculously poorly-coached, conceived, timed and executed fake punt, but throughout the game you could see that the stage was too big and the lights were too bright for Kirby. Come to UF, studs. 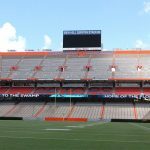 You can win an SEC and National Championship here under Coach Mullen and make UF and the state of Florida proud!!! I’m concerned about our 2019 recruiting class. It’s like we aren’t even out there visiting. As we all know, the 2020 and 2021 guys are definite maybes and cannot be depended on seriously until we get closer to their signing days. From what I have seen on other talent sights we should not expect to see any major 2019 player/signee chgs. Ranking 11th in the SEC is a travesty. Very disappointing!